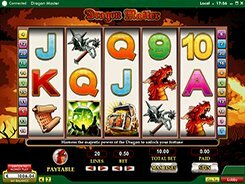 Dragon Master is a 5-reel 20-payline video slot themed around magic and dragon legends. Though visually rich and engaging, the slot is fairly straightforward offering a wild, a scatter and a free spin round. The symbols relate to the theme and include a dragon, a magic scroll, a treasure chest, and other themed icons as well as classic playing cards. The game will appeal to mid to high-limit players since a total bet is adjusted from $1 to $200 with all bet lines activated, yet low-rollers and players who are new to video slots may still bet as low as $0.05 per line. 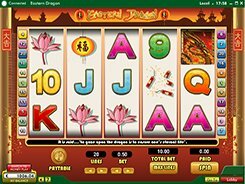 A wild is represented by the Dragon Slayer that substitutes for all regular symbols and awards a 4000-coin jackpot which is equivalent to $40,000 on the maximum stake. The second largest prize worth $20,000 is paid off for hitting five scatters (Magic Orb) anywhere on the reels. Three or more scatters award 10 free spins with all prizes doubled during the feature. Dragon Master has a basic gameplay, but the action is far from boring thanks to frequently hit prizes that will keep you at the edge of your seat. PLAY FOR REAL MONEY!